U.S. senators said they were closing in on a deal Monday that would reopen the government and push back a possible default for several months, though many hurdles remained as a Thursday deadline drew near. By Richard Cowan and Thomas Ferraro. The Senate’s top Democrat and top Republican both said they hoped they could soon reach an agreement that would allow them to avert a looming default and end a partial government shutdown that has dragged on for 14 days so far. “I’m very optimistic that we that we will reach an agreement that’s reasonable in nature this week,” Senate Democratic Leader Harry Reid said on the Senate floor. Lawmakers are racing against the clock, with U.S. officials estimating that the federal government could run out of borrowing capacity on Oct. 17. The plan under discussion would raise the $16.7 trillion debt ceiling by enough to cover the nation’s borrowing needs at least through mid-February 2014, according to a source familiar with the negotiations. It also would fund government operations through the middle of January, keeping in place the across-the-board “sequester” spending cuts that took effect in March, though government agencies would have more latitude to ease their impact. It would also set up a new round of budget talks that would try to strike a bargain by year’s end. Any deal would also have to win approval in the House of Representatives, where conservative Republicans have insisted that any continued government funding must include measures to undercut President Barack Obama’s signature health law – a nonstarter for Democrats. The deal would not resolve the disagreements over long-term spending and health care that led to the crisis in the first place. It would amount to a clear retreat for Republicans who have sought to tie any continued funding and borrowing authority to measures that would undercut Obama’s Affordable Care Act. 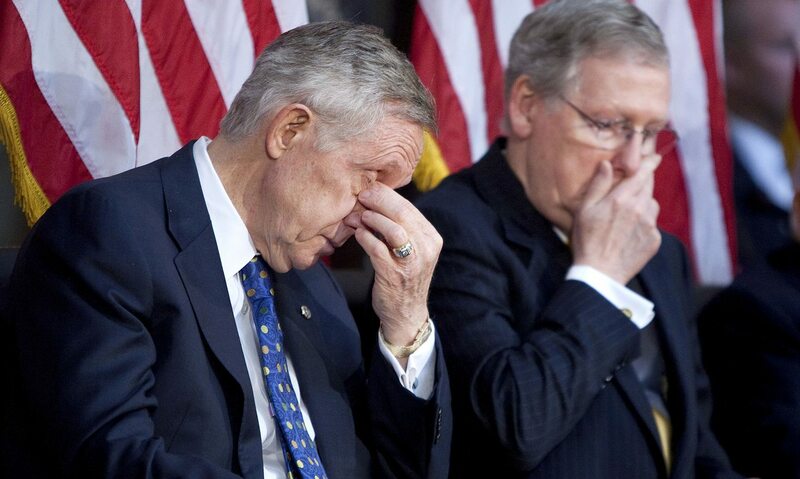 Senate Republican Leader Mitch McConnell of Kentucky echoed Reid’s comments that a deal could come together soon. “I share his optimism that we we’re going to get a result that will be acceptable to both sides,” he said on the Senate floor. The White House postponed a planned 3 p.m. (1900 GMT) meeting with congressional leaders in order to give negotiators more time to work out a deal. The Treasury Department says it cannot guarantee that the U.S. government will be able to pay its bills past Oct. 17 if Congress does not raise the debt ceiling by then. A default would likely come by Nov. 1 as Treasury would not have enough tax revenue coming in to cover interest payments, retirement benefits and other obligations. It is unclear whether Congress can meet that Oct. 17 deadline. Even if Republicans and Democrats in the Senate reach agreement on Monday, hard-liners such as Texas Republican Senator Ted Cruz might be able to exploit Senate rules to delay a vote for several days. House Speaker John Boehner also could face an insurrection that could threaten his position as Washington’s top Republican if he tries to advance a bill over the objections of rank-and-file conservatives in that chamber. “If the Senate comes to an agreement, we’ll review it with our members,” Boehner spokesman Kevin Smith said. Though Treasury likely will have enough cash on hand to meet its obligations for a week or so, it might be forced to pay a higher interest rate on debt it is due to issue on Thursday. Though some Republicans have argued that the government could avoid serious consequences by prioritizing interest payments over other types of spending, that view is not widely held by the public. U.S. stocks were buoyed by prospects of a deal. The S&P 500 Index closed up 0.41 percent while the Nasdaq Composite Index ended 0.62 percent higher. The government shutdown, now in its 14th day, is beginning to weigh on the economy. The hundreds of thousands of federal employees who have been temporarily thrown out of work are likely to get back-pay when the standoff is resolved. But they aren’t getting paid now, forcing many to dial back on personal spending and cancel holiday travel plans. The crisis is only the latest in a series of budget battles in recent years that have repeatedly spooked investors and consumers. The uncertainty has weighed on the economy and boosted the unemployment rate by 0.6 of a percentage point, or the equivalent of 900,000 jobs since late 2009, according to a new estimate by the Peter G. Peterson Foundation, a think tank. Foreign leaders and business executives have urged Washington to resolve the crisis before it does further damage. “This is all bad for America, bad for the economy, bad for job growth, bad for consumer confidence, and the quicker we get it resolved, the better,” Terry Lundgren, chief executive of retailer Macy’s Inc, told Reuters. Republicans in the Senate are pushing to include slight modifications to the Affordable Care Act. One would toughen income verification for those seeking health insurance subsidies under the law. Another could delay a reinsurance fee included in the law that otherwise would start in 2014, according to a labor-union source. Throughout the shutdown, Obama has said Republicans must agree to reopen the government and extend the debt ceiling before the two sides can begin talks on spending or tweaks to his Affordable Care Act.